We recognise that routines for Toddlers are an important opportunity for learning. Performing daily, predictable tasks while having fun is a chance for Toddlers to build their self-confidence, communication and social skills and the ability to develop their self-control. Our Toddler learning journeys contain a daily rhythmic routine which assists them to transition between activities throughout the day. We believe that if children can anticipate, they can participate at their best. Toddlers who join us early for the day are invited to enjoy a nutritious continental breakfast with their friends and other early risers. Social and emotional wellbeing is an important part of Toddlers development. To support this our little ones are warmly welcomed by their educators and peers with friendly smiles, waves and hugs. It’s important for families to support their Toddlers in completing their morning tasks, which encourages independence and builds their confidence. 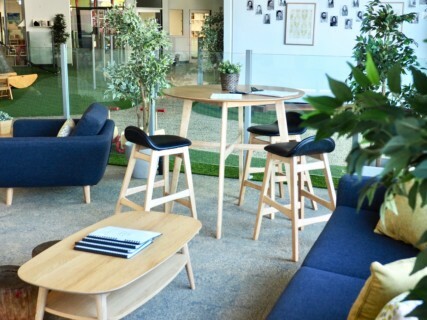 Families can take the time to relax and enjoy a barista made coffee and baked treat and ease into their day in our beautifully designed lounge. Green Leaves Early Learning education and care programs are inclusive of all extra-curricular activities including excursions and visiting shows. We do this because we are committed to ensuring that no child misses out. Our Toddlers excitedly experiment with instruments in their music lessons and enjoy the relaxation of their yoga classes too. Our Toddlers love our chef’s warm baked rustic carrot cake with diced apricots and coconut yoghurt. 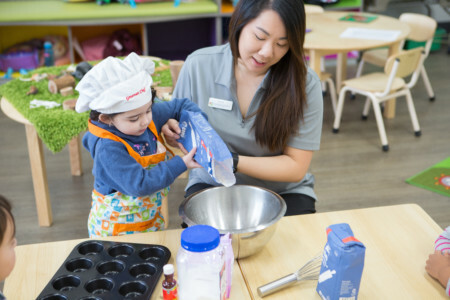 Toddlers respond well to exploring mathematical concepts during mealtimes and enjoy taking on the responsibility of measuring out ingredients during their culinary lessons. Expressive arts supports the self-discovery of Toddlers feelings and emotions. It’s not just about painting and drawing, and singing and dancing. At Green Leaves Early Learning, our approach to self-discovery is multi-faceted. Our aim is to develop a Toddlers cognitive, language, auditory, social, literacy, emotional and physical development. Toddlers can view the daily routine and always know when it’s lunchtime. 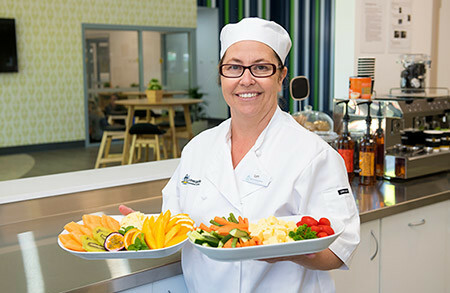 Wholesome meals and snacks that meet more than half of their daily needs are prepared by our qualified chef each day. 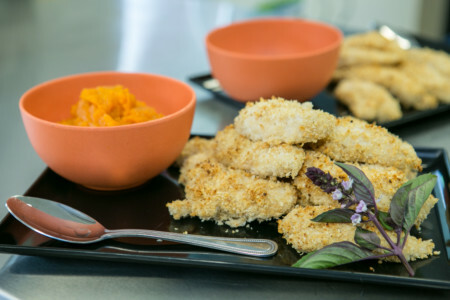 Enticing even the fussiest of taste buds, our buttermilk soaked, panko crumbed chicken breast tenders served on a bed of sweet potato mash is a favourite. During the middle of the day the environment slows down and the curriculum learning opportunities alter. Relaxation music assists to create an atmosphere where children can utilise a toddler bed, cushion, or a quiet place to rest and relax. Toddlers can engage is calmer curriculum experiences such as yoga, mindfulness, playdough and reading. 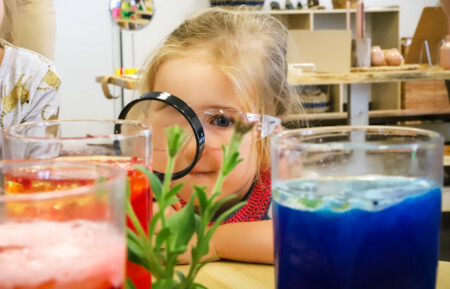 Science, Technology, Engineering, Maths (STEM) experiments and experiences for Toddlers, are designed to appeal to their interests and provide the opportunity to explore concepts independently or as part of their peer group. Measuring liquids and solids with scales, water play to test what sinks and what floats and; developing engineering skills by building super high towers are the types of STEM-based activities our Toddlers enjoy. 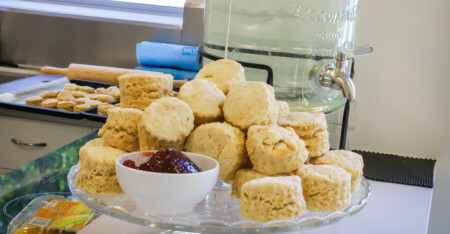 Our Toddlers eagerly await being served their fresh baked wholemeal scones for afternoon tea. During the warmer months these are served with a fresh fruit smoothie and in the cooler months, warm cocoa. Through our curriculum and the use of high-quality sustainable materials, we recognise the important role we play in guiding our children to protect and cherish their natural world for all to enjoy, now and into the future. 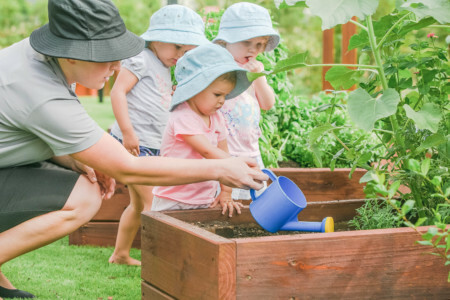 With a focus on beautiful outdoor playscapes, bountiful gardens and natural materials, our children can learn by example as our educators actively promote and participate in caring for our natural environment. As the day draws to an end, our Toddlers love to venture outside to play. For those collected in the early evening, a late snack can be provided to tie hungry tummy’s over until dinner. We begin to farewell until tomorrow ensuring each child leaves the centre feeling valued and eager to return. We invite you to explore our Bubs and Little Scholars learning journeys here. Foundational life skills are pivotal in our Kindergarten and Pre-school curriculum and underpin the school-readiness programs we offer our children. 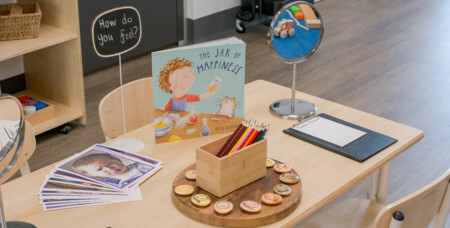 The Little Scholars learning journey celebrates children's individuality and encourages their love of self and learning through innovative and inspiring play-based opportunities.